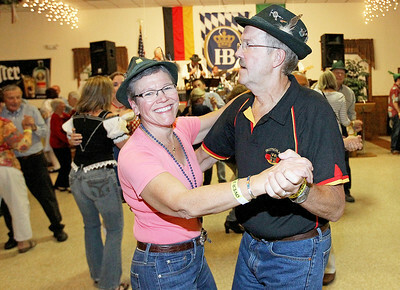 Candace H. Johnson-For Shaw Media Christine and Frank Gieber, of Littleton, Colo., dance to traditonal German music performed by the band, Phenix, during Oktoberfest at the American Aid Society of German Descendants in Lake Villa. 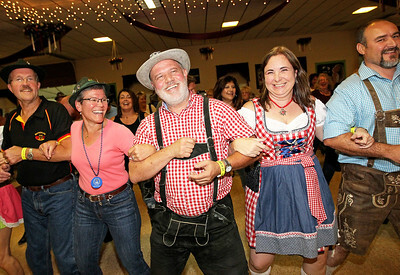 Candace H. Johnson-For Shaw Media Frank and Christine Gieber, of Littleton, Colo., Richard Noeller, Kony Klein, both of Chicago, and Scott Klapper, of Geneva, dance to a traditional German song by the band, Phenix, during Oktoberfest at the American Aid Society of German Descendants in Lake Villa. 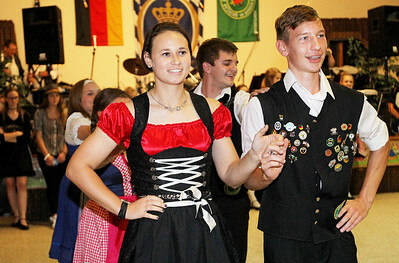 Candace H. Johnson-For Shaw Media Ella Palffy, 14, of Arlington Heights dances to traditional German folk music with a member of the Youth Group during Oktoberfest at the American Aid Society of German Descendants in Lake Villa. 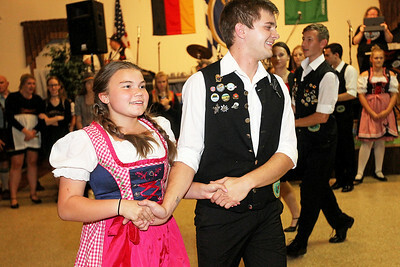 Candace H. Johnson-For Shaw Media Tara Nikolich, 18, and her partner, Christian Kiefhaber, 24, both of Chicago with the Youth Group dance to German folk music during Oktoberfest at the American Aid Society of German Descendants in Lake Villa. 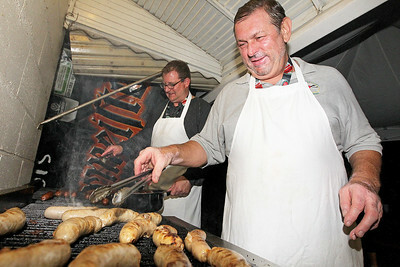 Candace H. Johnson-For Shaw Media Robert Lengfelder, of Norridge, president, and John Gabler, of Gurnee grill Thuringer sausage and bratwurst during Oktoberfest at the American Aid Society of German Descendants in Lake Villa. Candace H. Johnson-For Shaw Media Christi Mueller, of Gurnee serves Feigling Vodka during Oktoberfest at the American Aid Society of German Descendants in Lake Villa. Candace H. Johnson-For Shaw Media Glen Sorgots, of Wheaton with the band, Phenix, plays traditional German music on his trumpet during Oktoberfest at the American Aid Society of German Descendants in Lake Villa. Candace H. Johnson-For Shaw Media Glenn Beyer, of Johnsburg, Steve and Marie Konczyk, of Palatine and Liz Beyer (Glenn's wife) get ready to drink some Jagermeister cold shots during Oktoberfest at the American Aid Society of German Descendants in Lake Villa. 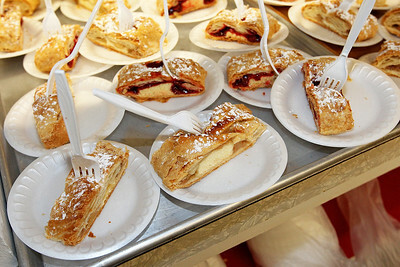 Candace H. Johnson-For Shaw Media Apple and cherry strudel is served during Oktoberfest at the American Aid Society of German Descendants in Lake Villa. 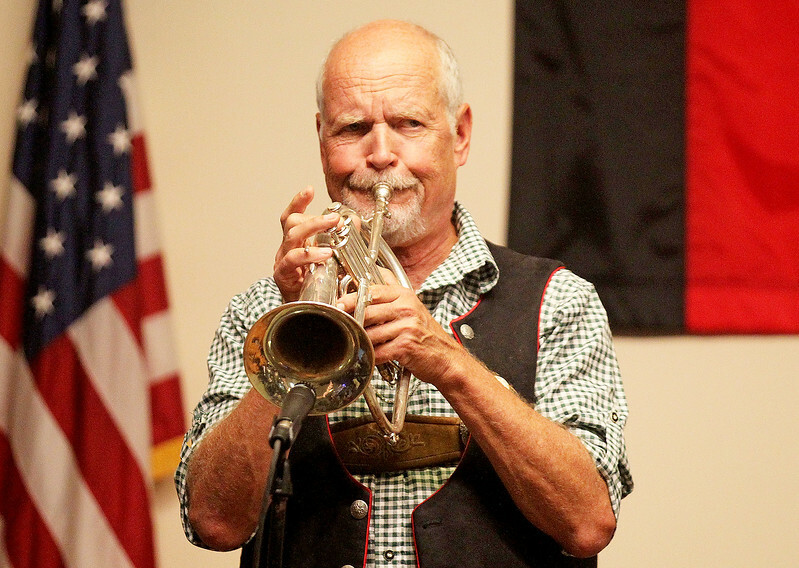 Glen Sorgots, of Wheaton with the band, Phenix, plays traditional German music on his trumpet during Oktoberfest at the American Aid Society of German Descendants in Lake Villa.